We would like to extend a very warm welcome to all students and their families considering joining the Eltham High School community in 2019 and beyond. Choosing the right school for your child is an important decision and we look forward to sharing this journey with you. Tours start at 9.30am prompt. Please note that we have a great deal of interest in our tours, so you are encouraged to book in advance by contacting our Main Office on 9430 5111 to secure a place. The Open Morning on Wednesday 3 April offers families the chance to join student led tours to see our school at work. Tours depart from the General Office at: 9.15am, 9.30am and 9.45am. Bookings are not required.Morning tea will be provided at 10:00am. On Wednesday evening from 6:00pm demonstration classes will be running. The formal information session for 2020 prospective parents will be held at 7:00pm in the Nalleijerring Performance Space.All information and the paperwork required for 2020 applications will be provided in this session. After the information session, there will be an opportunity to view learning area displays and speak with our teachers. Please check for signs directing you to extra parking on the school grounds for the Information Evening. Eltham High School has an approved enrolment ceiling aligned with the facilities available. The school follows the Northern Metropolitan Region of the Department of Education and Early Childhood Development Guidelines for enrolment, as outlined below. You have a guaranteed place if: Eltham High School is the closest government secondary school to your permanent home address. The web site here may assist in determining your nearest school. Type your address in the text box on the home screen, and then under the returned map choose amenities nearby, Schools - public secondary. You will be considered for enrolment if there is a sibling enrolled in another level at Eltham High School in 2020. Language: your child wishes to continue their study of French or Indonesian and the selected language is not offered at your nearest neighbourhood school. 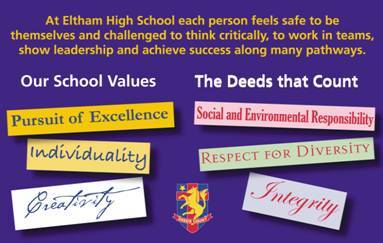 Student Leadership: your child has demonstrated strong leadership qualities and wishes to engage with the student leadership opportunities that Eltham High School has to offer. Further information can be obtained by contacting Melissa Hughes (Junior School Leader) on 9430 5111 or by email at huh@elthamhs.vic.edu.au. 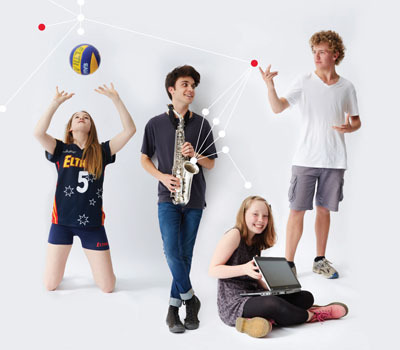 You have a guaranteed place if Eltham High School is the closest government secondary school to your permanent home address and you are not enrolled at any other Victorian Government secondary school. In most cases, the school requests enrolment commence at the beginning of a Semester. The web site here may assist in determining your nearest school. Type your address in the text box on the home screen, and then under the returned map choose amenities nearby, Schools - public secondary.